TritonWear is so beneficial to coaches because it gives them freedom from routine tasks like taking splits. As Jeremy confirmed, TritonWear allows him to put down his stopwatch and give more attention to his swimmers. With the confidence that data is constantly being collected and compiled for all swimmers simultaneously, weight is lifted from a coach’s shoulders. Jeremy explained that it’s much more efficient to be able to watch everybody in the pool and then pull up data for specific swimmers, rather than get stuck collecting metrics for a single swimmer at a time using traditional methods. “I really like having everybody’s information instantly accessible for myself during the workout, so that I can relay it back to the swimmers.” TritonWear puts Jeremy in a better position to spot-check swimmers during practice. 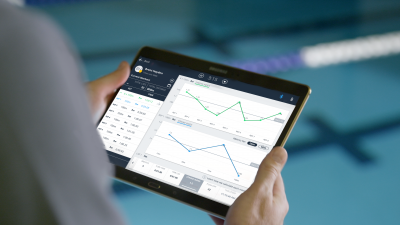 If someone is not performing at the level they should, he can easily pull up that swimmer’s metrics on his iPad to see what can be changed in real time and improve performance in the practice. Jeremy was proud to say his swimmers were quick to understand the connections between the data and their times, but he’s going to continue using TritonWear as a learning tool. “We’re really going to work on educating the girls on the metrics so that they take more ownership.” By breaking down a swim into components using the data, coach and swimmer are able to see which areas are lacking and map out a road to improvement. Another thing Jeremy is looking forward to is using the TritonWear systems during multiple progression sets, and then comparing the metrics over a longer timeframe to see where breakdowns occur. The more data he collects on each swimmer, the easier it will be to identify areas of weakness; the benefits of using TritonWear technology will only increase over time. Jeremy gave TritonWear a solid 9 out of 10 rating. “I’ve been really happy and impressed with it,” he said with satisfaction. When asked if he would recommend TritonWear to other coaches, he had a competitive response. “No, I don’t want other coaches to use it! I want it all to myself.” The reason for this is clear: TritonWear is effective. “I think it is a huge benefit and advantage.” In a highly competitive Division I system, coaches want any advantage they can get.